Low Season Specials (4/15-12/15, 2018): Discounted rates may be available for stays of 14 nights or more or stays that fill all the nights of a gap. Please contact us for specific arrival/departure date requirements. This affordable one-room efficiency unit is a tropical retreat that has been stylishly remodeled with granite bathroom counters and walk-in shower. The unit is equipped with mini-fridge, coffeemaker, toaster, and microwave, large flatscreen TV, and private lanai (patio). Contemporary island-style furnishings and artwork. Free wifi internet throughout, undercounter refrigerator, microwave, coffeemaker, and toaster (no burners/cooktop). 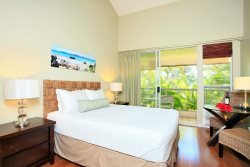 The unit is tastefully furnished with 2-person dining set, and large flat screen TV. There is a small private lanai (patio) and while this is classified as a garden/mountain view unit, there are partial ocean views from the lanai. This unit includes high thread count linens, soft fluffy towels and beach towels, Boogie boards, beach chairs, and a cooler. *Please note that this is a 300sf efficiency unit with convenience kitchenette (no cooktop/oven or separate sink) and no access to a washer/dryer. It is a great budget alternative to a hotel room, but we do not recommend the studio for longer or monthly stays. Mid-stay linen change is provided for stays of 14+ nights.